Monday Mirthiness – Greta’s two degrees | Watts Up With That? Willis goes on in the article to point out some of the benefits of that 2°C warming. The thousands of years of the Holocene Climate Optimum were often globally two degrees warmer than now. The result: civilization. There must have been even more available heat just before the Holocene Optimum to melt the vast ice sheets that covered the northern hemisphere, and then warm that water and the oceans from less than 2 degrees to 5 degrees the last 18,000 years. The little bit of warming we have had (.8 C) out of the LIA is hardly a drop in the bucket compared to that and no where near the warming the earth experienced since the ice age ice sheets melted. Natural variability is enormous and not much we can do but go along for the ride. Worrying about another 1/2 degree or even 1 degree warming over the next 50-100 years should be the least of our concerns. Actually, we should be celebrating it and the additional CO2 we have made available for the planet. ……It’s really too bad that we are frittering it away and letting it get away from us. Even warmer during the Carboniferous epoch. HUUUUUUGGE dragonflies!!! And then, there was Euphoberia, which lived 300 million years ago, and was the largest centipede on record, growing up to 39 inches in length. It lived alongside the largest land invertebrate ever: Arthropleura, a close relative of the centipede. Arthropleura reached 8- 1/2 feet in length. Eight and a HALF FREAKING FEET!!!! Holy Macaroni!!! Can we get one of those giant multipedal critters to use as a way to stop this nonsense??? I’ve seen photos sent by troops in Vietnam holding up 3′ 6″ centipedes, but that is nothing compared to Arthropleura. And that enormous size was all the result of very high levels of oxygen (produced by plants) in the air. Something had to use it up, right? N.B. : The reason there haven’t been any fossils bigger than the griffinfly (Meganeura) is that something probably ate them before they were covered in mud and iron dust. Those could replace Cattle Ranches. I was thinking the same thing. Arthropleura reached 8- 1/2 feet in length. That’s a lot of protein. I don’t want to put too much of a dampener on this but please let’s not attack this deluded little girl. She’s a juvenile with an autistic spectrum disorder. Special needs. She has no idea what she is talking about because she doesn’t have the mathematical and scientific training to analyse what she is being brainwashed about. She has suffered child abuse, and we should treat her in that light – not laugh at her. Please let’s direct our fire elsewhere. The indoctrination centers we laughingly call schools are creating this autistic spectrum disorder. Seems a socko paddle to the pants bottom and an extended detention in her bedroom is the proper remedy. It use to be that skipping school warranted a grounding but nowadays we should keep them away and home school. I strongly suspect recreational drug and alcohol abuse by parents prior to conception and during pregnancy contributes to the many children today that are autistic and have behavioural issues such as ADHD. actually Andrew Wakfield may end up getting apologies. what he stated was vaccines upset gut bacteria..and recently more and more evidence is accruing that gut bacteria/biota ARE linked with issues like autism parkinsons and alzheimers. also today was a long overdue admission that ALL sodas are doing harm even in moderation, and diet versions of ALL the fake sweeteners actually kill gut bacteria . higher stroke and heart attack rates also claimed as well as obesity diabetes issues. I really DO think theres going to be some proveable linkages to that also. safe food comes in Glass containers. and they are well and truly reuseable, safely. So how does she differ from AOC? The hand up their back? Romulus and Remus were. Well, sort of–they were raised by a she-wolf. Well, AOC is on the normal track to become a climate change millionaire, ala Al Gore. Then again, when this tyke torques her inevitable Nobel Prize, the won’t need garage sales either. If you think AOC is squirrely you shoulda seen Beta O,Roarke on 60 minutes last night. He is nuttier than a shithouse rat. Must be something in the DNC coffee..
Good source of memes like AOC. His DUI mug shot is the latest. 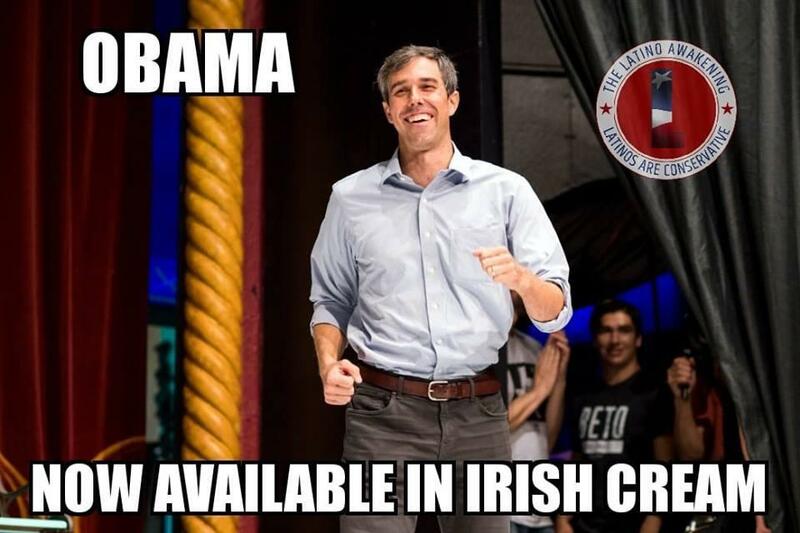 This is how easy it is to meme Beto. In the link above this tweet complained about people making fun of him. Just the Republican Party trolling a Democrat party nominee, because there is no bottom. 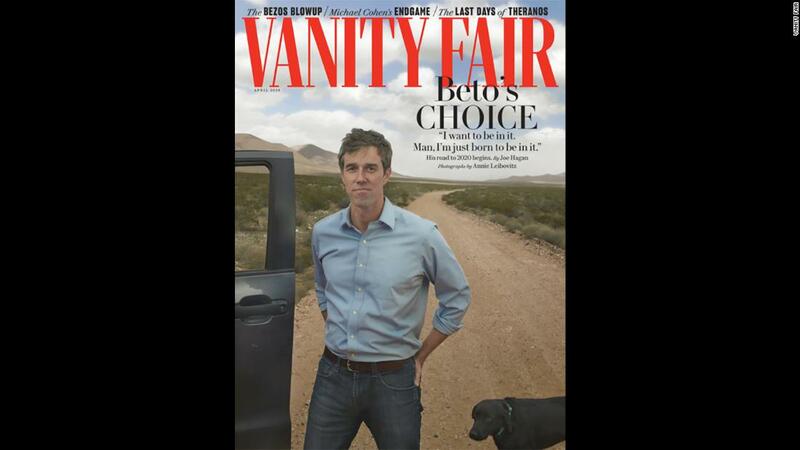 If Beto can last ’til end of October, then college kids will again be able to wear halloween costumes with sombreros and panchos. 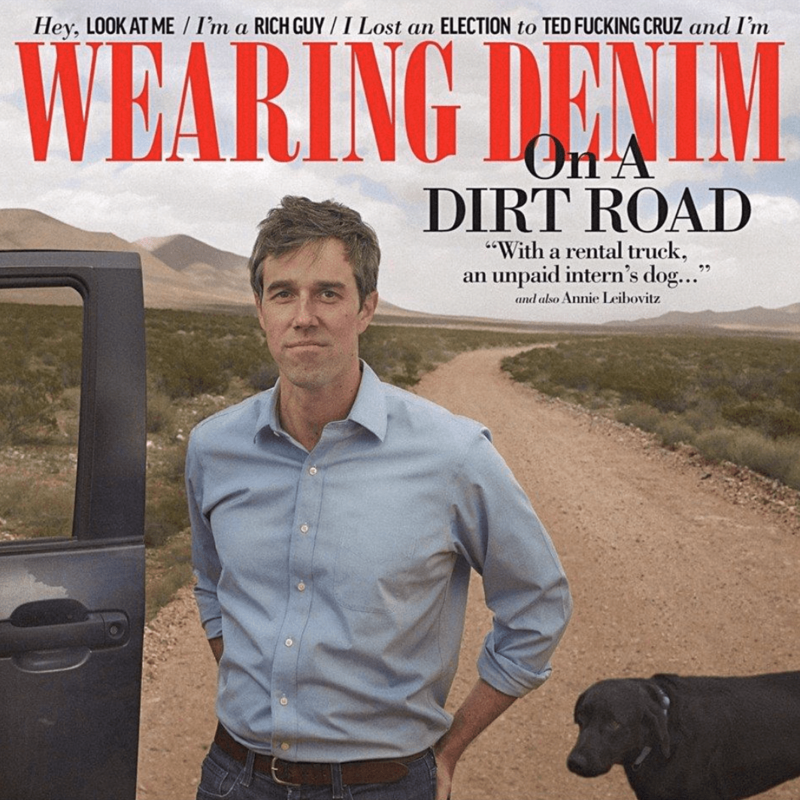 It won’t be dreadful cultural appropriation, it’ll be a “Beto” costume. Could present a real problem for our many University Diversity Departments. No. You have to confront them. Because Ecofascist kids grow up to be Ecofascist adults who become disillusioned and bitter and shoot up a Mosque full of defenseless people. Misanthropy and catastrophe leads to utter despair and the most awful of outcomes. Better that they be disabused of their misinformed delusions now, than later. Parents cannot use their autistic children as cover to push their agenda. Josh is not attacking the girl. Just merely pointing out the absurdity of her situation. Perhaps a remake with her parents cheering in the background and reacting as well would be better. C’m on, please, stop being pc in a caricature. That means the caricaturised have the last laugh. Indeed, I feel truly sorry for Greta. It will be hard for her when she grows up and understands that she has been used as a tool for vulgar propaganda. If she persists in her delusions, that’s not nice to contemplate either. She doesn’t need scientific training. She just needs to be honest about historical facts like CO2 level increases always lagged temperature increases, and 90-95% of the world didn’t have thermometers during the turn of the century that would allow for a meaningful comparison of world temperatures now against then. There are many others. Diagree. She doesn’t get a pass on her BS becuase she can hide behind her disabilities. Special needs=stay home. Jumping out in front=take your lumps like everyone else. Indeed. Once you jump in the public arena, you can not expect special treatment from everyone else. But that’s what the left do, they pick “special” spokespeople that they tout as being unassailable. How dare you disagree with them, their special status means you must listen and accept everything they have to say. Ian: Of course you are correct. However…we can’t overlook this child’s potential to negatively influence on other children and the scientifically illiterate in our society. No matter how young, when a person sets out to intentionally cause worldwide damage, regardless how well-intended, the plugs must be pulled to stop the nonsense. She needs to know just how unjustified her fear and claims really are and who the real culprits are in the whole ruse. If she steps onto the battlefield, she should expect to be fired upon. Besides, she knows full well what she’s doing… she’s creating publicity for her mother’s new climate alarmism book. It’s a cynical ploy to make money, nothing more. I doubt she’s even on the autistic spectrum… the way these leftists lie, that’s exactly what I’d expect them to say to deflect any attacks by saner people upon her delusional blather. They want to tear down our civilization (what they call ‘de-industrialization’) and set up totalitarian governments. They’re already succeeding in preventing third-world countries from industrializing. They’re responsible for more death due to disease caused by a lack of functional infrastructure than the non-existent catastrophic climate change they keep shilling for. She deserves, and shall receive, no mercy from me. If she reads this blog she wouldn’t say what she says. Her lacking skills ought to have her guardians take theit job seriously. That means to prevent her to make herself sort of laughing stock of our millennium. You can’t claim vulnerability when you stick your head out of the green mud and then complain about getting an ultra sharp shave. Please let’s direct our fire elsewhere. In times not so long gone by, the children asked their parents and grandparents why they did not prevent or even followed Hitler or Stalin or Pol Pot when they were young. The children of today, who ought to have learned that following the wrong ideas causes endless misery, make the very same mistake over again. Why are we not strongly pointing out the even higher warming period of the Holocene Optimism, a centuries long period that was warmer than it is now? Maybe at least 2C warmer than now? Greta really should do the intellectually honest thing and study both sides of the issue. Yes, she might want to ponder the maunder. She’s sixteen. Not the time in life when integrity and reflexion is most developed. Kids at that age has plenty of stuff to struggle with in any case. Yep, that’s exactly how old Kristen Byrnes was. And that’s the age to which the Democrats want the voting age lowered. They want more proxy votes from the ignorant and easily manipulated. They might as well allow live stock to vote. After all, aren’t they effected by events too? One thing worth protesting is the use of RCP8.5. Children who become aware of the sheer scale of the lying they have been targeted to receive will protest that alarming claimants “protest too much”. Kids have to protest something – its healthy. One thing it does is teach the adults how and in which direction they have been misinformed. There is a great documentary on Myanmar on Al Jazeera right now. The bright spot is at the end when they interview young people who are not monks nor soldiers nor victims, and we get to hear the deep common sense of the truly educated – those who think of themselves as ordinary people who have to solve problems facing their community, including the madnesses of racism, woe begotten priests and a military seeking new enemies to justify their budgets. Good on ya, kids. It’s pretty tricky to teach kids to be doubtful about what adults tell them. It’s really unfortunate that it is necessary. Even adults get excited about what the politicians promise every election and we really should know by now what a pack of chronic liars they are. How do you alert kids to attempted manipulation without making them cynical? That’s an issue. You may be aware of a certain J. Trudeau who promised “sunny ways” and elimination of the deficit along with free money for everybody ( except white males). I know it was long long ago but in 8th grade. We were given a weekly “current events” assignment to bring in a newspaper article (yes, that long ago). Then we had to describe what was opinion in the article, what wasn’t opinion, and how we could tell what was factual and what wasn’t. I definitely learned that there is a lot of opinion reporting and that it isn’t easy to know what is factual and what isn’t (that takes looking at things other than the specific article). Everyone ought to take a course like that. People should be taught not to accept everything they see or hear at face value, especially when it comes to news coverage, because there may be a hidden agenda. Same here in Ontario, Canada in 1978 during an election year. First time I ever heard what liberal (actually Liberal, as in party) meant vs. what conservative (actually Progressive Conservative, yes that contradicts, but it was a party) meant vs what socialist (actually social democrat, as in the New Democratic Party) meant. Turns out, our parents were biased towards one or the other, and that, and I know you’ll be shocked to learn, that meant…we were (even at the age of 13 or so). But I learned to read for bias, a very useful skill, which they don’t teach any more. Probably a triggering micro-aggression now that will cause permanent disability. It’s not tricky in the slightest. My children all have finely-tuned BS meters, and I’ve encouraged them to boldly question everything, as I often attempt to trip them up with logical traps. I expect by the time they become teenagers, they’ll have the intellectual capacity and curiosity to research and demolish any lies they’re told. I’ve given my children jobs to teach them the value of money… they earn 25 cents for each new word they can spell and define, and I randomly test them after that. If they fail the test, they owe *me* money. My oldest has earned hundreds of dollars, has a larger vocabulary than I’ve got, and has only paid me back 75 cents to date. They also earn 50 cents for each page they complete in their extra-curricular educational workbooks, and I randomly test them on that, as well. They use that money to purchase things they want, such as shoes, bikes, toys, etc. I’m letting them waste their money now, knowing they’ll want something in the future and not have the money to buy it, teaching them the valuable lesson that they should save for the future. After that, I’ll introduce them to investing, but they’re too young for technical and fundamental analysis just now. Soon, though. They listened to what Hitlery ‘Cankles’ Clintoon was saying during the election and pronounced their support for Trump. They listen to the loons on the left saying they want higher taxes and realize that’s going to cut into household income and thus limit their income. They listen to the loony-left saying they want ever-higher minimum wage and realize that’ll limit their future employment prospects as employers cut employees to maintain profits, making it more difficult for them to earn their way through college. I did a one-week experiment in socialism, where everyone had to chip in their earnings from their vocabulary work and workbooks, and they all got a pittance in return… they were all unhappy about it (especially since the pittance they got wasn’t even enough to buy a single ice cream at the park, whereas ‘Dad The Socialist’ ate three ice creams on their earnings), and learned that that is what socialism does, it takes your wealth from you, returns to you a pittance, then claims it’s ‘saved’ you from yourself. They revolted, refusing to do their work for the last three days, whereupon they learned that socialism removes the incentive to improve yourself by removing the incentive to earn. They’re died-in-the-wool capitalists now. 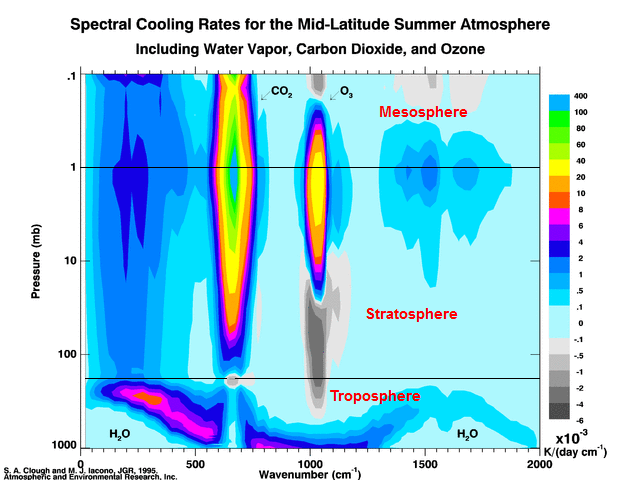 Note the CO2-induced spectral cooling rate (positive numbers in the scale at right) extend right down to the surface of the planet, whereas CO2 shows just a slight bit of warming (negative numbers in the scale at right) only at the tropopause (ie: just above the clouds, where it absorbs a greater percentage of reflected solar insolation). Yes, I’m teaching my adolescent children the basics of quantum mechanics. You’d be surprised how easily they pick stuff like that up, when they realize they can understand how the entire universe works. Alas, they’ve become smarter than me, and I fear I have little else to teach them besides investing and morality. Ever see a kid multiply two four-digit numbers in their head? They tried to teach me how to do it, but my ossified brain couldn’t pick up the necessary patterns. All that is required to teach your children is to *talk* *to* *them*. Some people seem to think that’s too much work, I reckon. Maybe that’s why we’ve got so many idiot children out there. Liberals believe that if we stop burning fossil fuels, the Earth will return to the Garden of Eden. We should point out to them that in the Garden of Eden Adam & Eve ran around naked. I’m pretty sure it was at least 10 degrees warmer than present day Earth. I blame Germany for ALL that EURO-Warming … if they hadn’t been working and manufacturing so damn hard to €bail out€ the dregs of the EU … Europe’s temperature would have been “safe”. Shame on you Frau Merkel… shame on German industriousness. Why can’t they be more like the “laid back” eco-Greeks and Spaniards? Greta will go on to never have a real job. She’ll land in some posh academia or NGO seat for a career in spewing useless junk. I can also envisage such a person to become an ardent anti-greenie actionist, chasing watermelons to bursting point round and round a non-sinking Pacific island. Nah a spot on some UN panel she ticks all the right boxes for demographics. Repeat until people catch on and stop sending a “only a few bucks” to charities who need millions of dollars just to keep the lights on, so they can hire people, so those people can convince kids to volunteer to stand on a street corner to beg passers-by for “only a few bucks”. I know I’m a bad man, but its going to feel good when, in a few years, most of these young’ns are so bitter and disappointed that the New NEW NEW!!! Apocalypse didn’t happen, and they’ll have to settle into dull and boring middle-aged, middle-class lives, where they’ll turn their lights down once a year on “Earth Hour” and spend an afternoon every year cleaning up their gentrified ‘hood on Earth Day. Trust me, I know of what I speak, because 35 years ago, I WAS one of those brainwashed teens. Had to read “Entopy” and “The Fate of the Earth”, and watch scary movies like “The Day After”…funny how we lived long enough to make a “sequel” called “The Day After Tomorrow”. Which is, suitably acronymed as DAFT. I suggest Gerta protests about the quality of her education and MSM’s output. Many students were vague on what action they wanted. If they said anything, it was to stop fossil fuels. For example a sign: “No more fossil fuel projects.” More evidence that the kids are not all right. Below is a reminder of what they will have to do without, should their wish come true. Because of her protests, she gets an EXEMPTION so she can keep using fossil fuels and benefit from using them, but us little people need to give them up to save her world of privilege. “Man meets child climate bedwetter @GretaThunberg… asks her about nuclear power. Josh gets it kind of wrong though. The 2C is Europe only. Greta’s bad dream is about 2C globally. Different animal. But I still think Josh is also right. The 2C in Europe has been beneficial. Josh gets it kind of wrong though. The 2C is Europe only. only because we don’t have the data for outside of Europe. But that’s actually irrelevant. Europe, in this case, is a test case that shows 2C isn’t necessarily harmful and in fact may well be beneficial. Despite of this, I believe you are correct. The subspace(x,t) where the result is clearly harmful is small compared to the subspace where it is beneficial or just a matter of valueing function. I’m sure Greta’s handlers will have no problem coming up with something else for her to protest. Climate change, 6 to 10 kelvin swings = evolution = the apex of evolution = humans. No climate change, steady state = no adaptation no natural selection, no survival of the fittest no change no evolution = no humans. Gary, you make a presumptuously biased apex selection, placing humans at the top. We are simply another tendril out on one of the myriad of branches. Assuming an apex assumes the evolution of life has a direction and a goal. It is merely an ongoing process. NO LIVES MATTER. THE UNIVERSE DOESN’T GIVE A DAMN ABOUT YOU! //At the apex of the turn his rear wheels apparently came unstuck from the oil-drenched groove. Humans are the most advanced species on the planet, we literally are the highest, uppermost point in evolution thus far. until a more advanced species appears on the scene, we are the apex. Near the end of last glaciation, CO2 levels dropped to 180 ppm (cold oceans absorb atmospheric CO2…that means the oceans take the CO2 out of the air and take it into the water of the oceans). At only 30ppm lower… at 150 ppm and ALL LAND BASED PLANTS DIE from CO2 starvation. How did it get so low? Oceanic cabonaceous animals build protective shells around their bodies and when they die THEIR SHELLS END UP AT THE BOTTOM OF THE OCEANS (quadrillion of tons of limestone is the result)… thereby taking some CO2 forever out of the atmosphere with them (except for the minor amount liberated when cement is made). That CO2 sequestration has gone on for many many millions of years causing a generally steady reduction in atmospheric CO2…from WAY WAY higher CO2 levels when plants and animals really flourished…better than now. It’s too cold now and there’s too little atmospheric CO2 now to optimize life processes. All plants evolved in much higher CO2 levels…plants are ALL in relative CO2 starvation now even at 400 ppm. And why they ALL grow much better at over 1000 ppm. At the current “geologic” rate of CO2 decline, all non-oceamic life would end on earth in only ~2 million years…near the end of some future inevitable glaciation (when the oceans are really cold again) when CO2 levels should finally dip below 150 ppm. That means no life on the land on earth (unless our distant offspring liberate CO2 from the earth to keep it alive). All dead. No life. It is colder now than over MOST of the last 10,000 years. Bet you didn’t know that. We are close to the lowest interglacial temperatures of the last half million years of this ice age. The earth did just fine when it was much warmer…like relatively recently during the Roman and Medieval Warm periods when civilization blossomed and flourished. You did not know that. You are the “know nothing”. You prove yourself to be a boorish ugly human to strike out at Greta. Especially when you are so uninformed. You DO know how to spout back propaganda from liers…that takes no intellect…in fact that REQUIRES very little intellect. We are done sitting back and taking crap from idiots like you. YOU GUYS STARTED THIS CONFLICT. Guess what…we are not going to surrender. We have real science and truth on our side. Greta, you can do betta. Stop listening to climate-alarm BS of your adult role models. is to me much the same thing as the Greta event. It is currently cold here in Sweden, and it is difficult to find an affordable heating source. Personally I am a bit privileged, in that I have access to firewood from my own little forest. However, most folks in Sweden live in cities now or build up areas, where nothing is free. About twenty years ago, Sweden had cheap and clean electricity from hydro and nuclear. These days they are closing down hydro and nuclear, and are going for windmills and solar panels, taxing all fuels and electricity to levels near the Danish prices. Greta will not feel that, her parents a pretty well off and in line with the official Swedish “green” policy. I would gladly entertain Greta if I happened to meet her, but her parents and the Swedish schools are here to blame. It was 10 years ago, I had a 13 year old girl coming home from school and being very upset about AGW. Her Mother and I did not have a chance to tell her otherwise, so deep was the indoctrination already back then. It was a few week before Christmas, it was cold winter, the Christmas lights were on and everybody were baking all these wonderful Christmas goodies. – Then suddenly total blackout. No, it was not just our house, it was dark all over the place. The blackout lasted about 3 days as far as I remember. The blackout covered the south of Sweden and the whole of Denmark. What happened? A high voltage power line in Sweden got too long and hit some small trees on the ground, resulting in the line being automatically switched off and the current directed through other part of the grid. However, now the load became too much for the other nearby lines, so they cut out too. In a very short time, the blackout propagated to Denmark, and would likely have continued down through German, if the Germans had not been quick to disengage the interlink between Denmark and Germany. Due to the magnitude of the blackout, it was difficult to get the power op and running. There was nothing to synchronize to and no power to start the big coal fired plants. The worlds largest diesel generator, at the time, at a power plant near Copenhagen, saved us the third day. The diesel has not been started for a number of years, but it was assumed there was compressed air enough to start it. If not, it would take several days to fill the bottles again. However, it worked. TV and radio was out there to see the first puffs from the smoke stack, when the Diesel started. Shortly after, the big power plants got up and running and synchronized. Light came back and Christmas was saved. I was studying electronics at the time, but even I was surprised of the reliance we already had back then on constant supply of electricity. It was kind of fun the first day, but thereafter it was a pain. Almost nothing in the society worked. I have my own three phase diesel generator here at home, so I would in a way like if the same thing with same duration would happen again one of these days. It would be nice to see these fools get exactly what they are asking for, as long as the rest of us weren’t equally subjected to the nonsense. However that is not the situation in which they wish to enslave us. Off topic but what happened to Nic Lewis’ presentation that was posted at WUWT a few days ago? The planet did an even larger experiment just 9,000 years ago during the Holocene Maximum, when it was 2 degrees warmer than now. And what happened then? Well, the Siberian Taiga forest was 200 km further north than now, opeing up new habitats, and the Sahara turned green and fertile. And as far as flora and fauna, there were no mass extinctions at this time. I think children have a much bigger issue to strike about: old age. I mean, how many centuries have humans had now to find a cure for ageing, and yet here we are, still growing old and dying. This is a travesty for these young souls, and they should not be taking it so lightly, distracting themselves by protesting something that amounts to a mere couple degrees. Come on kids! Get with the real issue — living a longer life, or even living forever. Do you really want to die? Shouldn’t you be protesting how adults will allow this to go on? By not focusing on perpetual life, or shall we call it “renewable life”, adults are shirking a great responsibility, knowingly allowing untold numbers of children to die of old age!! It is simply unforgivable — even more unforgivable to divert attention and resources to climate change, when the very issue of life itself is at stake! Okay, so you can save the planet. What the heck good will it do you, if you have only so long to live on it? Save YOURSELVES ! Strike for life ! That reminds me of an episode of the 1980s kids show “Kids Incorporated” in which a con-artist gets the kids to have a benefit concert for his charity. That charity’s goal: wiping out “natural causes” (because, you know, lots of folk die from natural causes it says so on their death certificates). The kids, of course, catch him trying to abscond with the money that was raised, he confesses his charity was a scam and in the end they give the money they raised to a real charity. to the very left wing side of USA Politics , rather than as I recall it being, ,as a middle of the road party. party is called Liberal, is so confusing to the USA people. It used to be called the United Australia party in he 1930 tees, but Menzies then a youngish politician went to the UK where he saw that the right wing Conservatives had as a opposition the Liberals, also in the mix was the then much smaller Labour Party. The Liberals are the Wigs of the old Wigs and Tories of the 17th Century, and were what today we would call middle of the road. The Labour party were in the 19330 tees still trying to find their place politically, with some on the left almost Communist. Political parties just as with people evolve, and change, but Menzies who was fed up with the Australian United Party, which was a very Rural based party, he wanted to move politically to the right, so he adopted the UK Liberals ideas of the 1930 tees as the standard for a new and more Conservative Australian Party. Today the Australian Liberal Party seems to have lost its way, and is now between some who want to be back in the middle of the political road, but of course the Australian Labour Party are already there, so we have the likes of ex PM Abbott saying that Morrison the present PM is too Liberal light, and so close to Labour that many people are saying that as there is so little difference between the parties that they will give Bill Shorten a go. As to what happened to the old United Party, they became ” The CountryParty”, but later when the construction of mining took off, and thus the money was no longer in the countryside, but the City, they changed their name to The Nationals. Its always about where the money is in the form of donations of course. Perhaps someone in the USA could write a similar explanation as to how the USA political system has changed over the years, especially how the Democrats seem to us to have changed from the Good Guys in the 1930 tees with FDR a hero of mine, with Harry Hopkins, to today where some of them seem to be more intent on destroying the US economy and thus verging on being Communist. That concludes the lesson on Australian politics. Metaphorically, the same fate awaits these poor kids of the CAGW Chilren’s Crusade.. We “denying” infidels will not be converted by these children to the CAGW Cult, the “miracle” of all life on earth ending in 12 years from the ravages of CAGW will not occur, and these poor kids will be exploited by the CAGW merchants for more grant money..
A little thought experiment….. Let’s give Greta omnipotence so she can bring climate change to a full stop anytime she pleases – past or future. When will she press the button? Minoan warm period at around 4 degrees warmer than currently or the LIA when thousands died from starvation and cold? Or even earlier in The Holocene when it was even warmer? That’s the problem, though. These idiot children have been led to believe that the climate doesn’t usually change, so they’re out there marching with signs which state, “Stop Climate Change”. This is partially because the puppetmasters have had to swerve away from “global warming” to “climate change” due to the still-ongoing “global warming” hiatus (which they first desperately tried to erase, but failed at miserably)… whereupon the disingenuous Luddites started attributing every weather event to “climate change”, to include global cooling. So it’s only natural that the useful idiots would think the climate doesn’t usually change. Why the pause? Well, because CO2 is not a ‘global warming gas’ as the IPCC and similar ilk claim. The Equipartition Theorem, 2nd Law of Thermodynamics and Quantum Mechanics proves that CO2 actually *cools* the atmosphere (via convection above the tropopause and thus above the effects of water vapor in the troposphere, then via radiative emission out to space in the stratosphere, mesosphere and thermosphere). That’s why the atmosphere has cooled and contracted over the years, causing NASA to state that space junk might stay in orbit as much as 50% longer than anticipated due to less atmospheric drag. The non-warming of the climate has become a topic much discussed since about 2005. John Christy has testified to Congress about the “gap” between IPCC climate models, which are based on steadily increasing levels of atmospheric CO2 and observations of atmospheric temperatures, measured by both satellites and radiosondes, 1978-2015 (see Christy fig. below). There have been many attempts to explain this discrepancy, ranging from a flat denial that such a gap exists (Tom Karl, Science, 2015, pp. 1,469-1,472, doi: 10.1126/science.aaa5632) to attempts to account for the “missing incoming energy.” For example, Kevin Trenberth has proposed that the missing energy, instead of warming the atmosphere, “hides” in the deep ocean, to be released later. Based on all the foregoing discussion, of the log-dependence of CO2 forcing (Myhre et al., GRL, 1998, vol. 25, doi: org/10.1029/98GLO1908) and its possible climate-cooling effect, I have a simpler hypothesis on the ineffectiveness of CO2 in warming the climate. I realize that this explanation is unacceptable to the IPCC and to many climate-warming advocates. I believe that the “gap,” now 40 years long, according to Christy, has existed throughout the Industrial Revolution — and probably during the whole of the Holocene. In other words, I consider that the “pause” may be permanent. I also believe that the gap will continue to grow in the future and demonstrate a convincing empirical argument supporting my explanation — namely, that CO2 no longer affects the climate, except perhaps at the slow level of its log-dependence. This log-dependence has to be modified (1) by CO2 cooling of the climate and (2) by possible positive feedback from water vapor, as assumed by the IPCC. When you’ve got so many clamoring morons who steadfastly refuse to educate themselves as to the historical context of what they’re protesting about, who refuse to examine the evidence that their blather is 180 degrees diametrically opposed to reality, there’s little one can do except help them self-destruct, or destroy them before they destroy all of us. Life has become so easy that they’ve forgotten (or never had any idea) how hard life used to be… it’s time to make life hard for them. The contemporary cooling we’re experiencing and will continue to experience for the near future should do the trick, as long as we keep a stiff upper lip when we see them, jobless and shivering, begging for someone to save them. Because we all know people as willingly delusional as they’ve become (and as willing to protest about it) don’t make good employees and don’t have the clarity of mind to successfully run their own businesses. So they’re going to be the first to elapse from exposure… and we have to let them. Should they gain enough political power to push through their Marxist agenda, then we’ll have to take a sterner course lest we all end up like North Korea. It’s time to stop mollycoddling the kooks.